Oh, how I love this portrait! 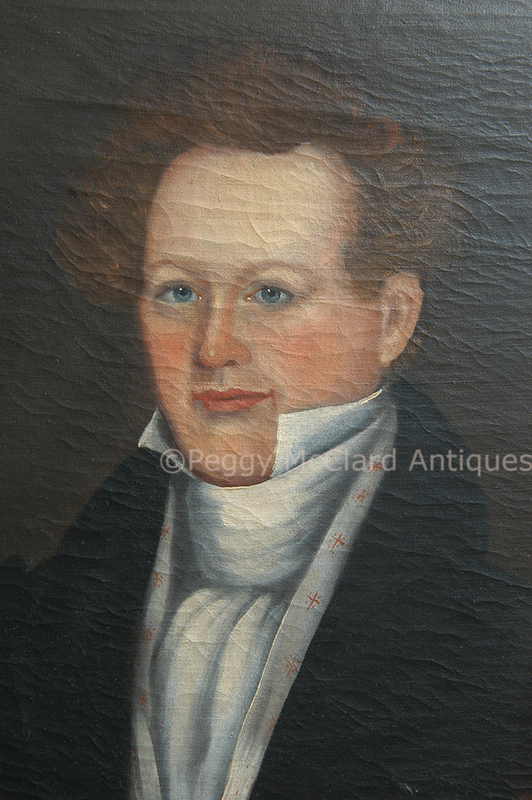 This is a 19th century American folk portrait, oil on mattress ticking of a red haired gentleman with a patterned waistcoat, sitting in a vibrant paint decorated chair. His beautiful blue eyes gaze directly at the viewer from above his rosy cheeks and full lips. His handsome face is surrounded by a bit of a wild styling of his red hair. 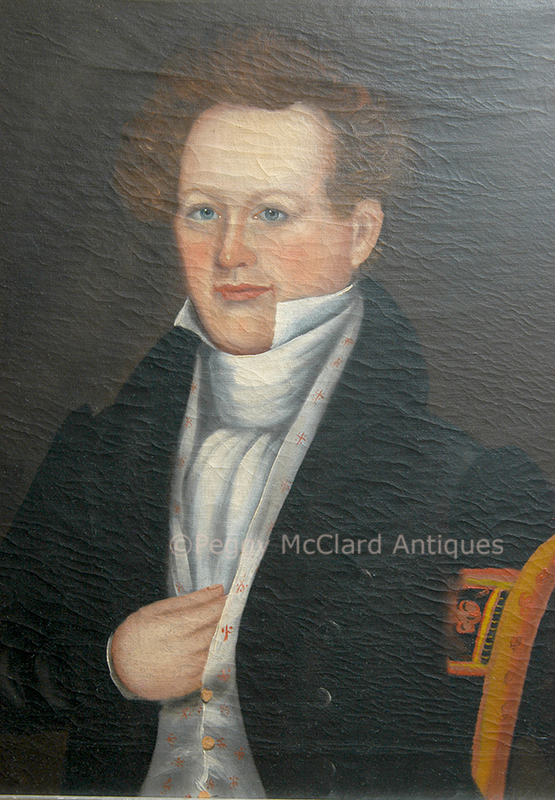 He strikes the classic “Hand-in-the Waistcoat” pose that was popular for portraits of men painted both in America and abroad. His waistcoat is subtly patterned, probably embroidered on silk and has gold-colored buttons. His jacket has gathering at the shoulders to make the sleeve stand up where it meets the body of the jacket. 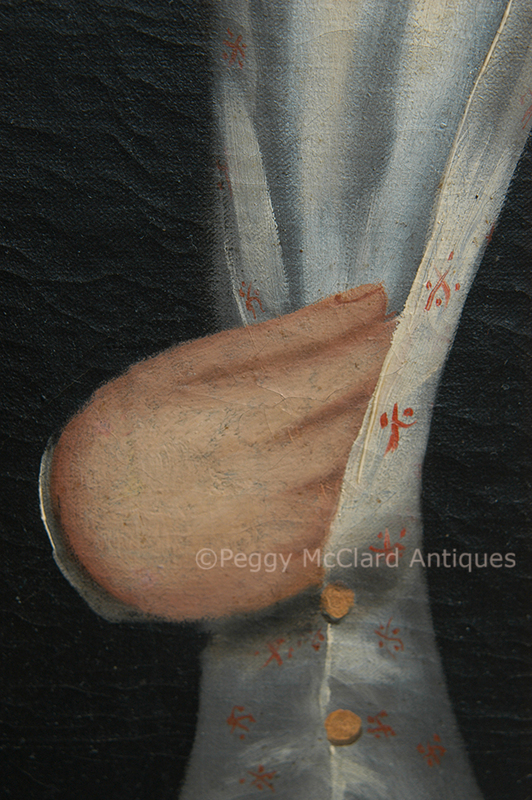 The sleeves are likely somewhat full and padded above the elbow in a somewhat toned down version of the en gigot style that was so popular and exaggerated for women’s fashions of the 1830s. I can’t tell whether the jacket is single or double-breasted but it has the typical shawl collar which stands tall to frame the face. 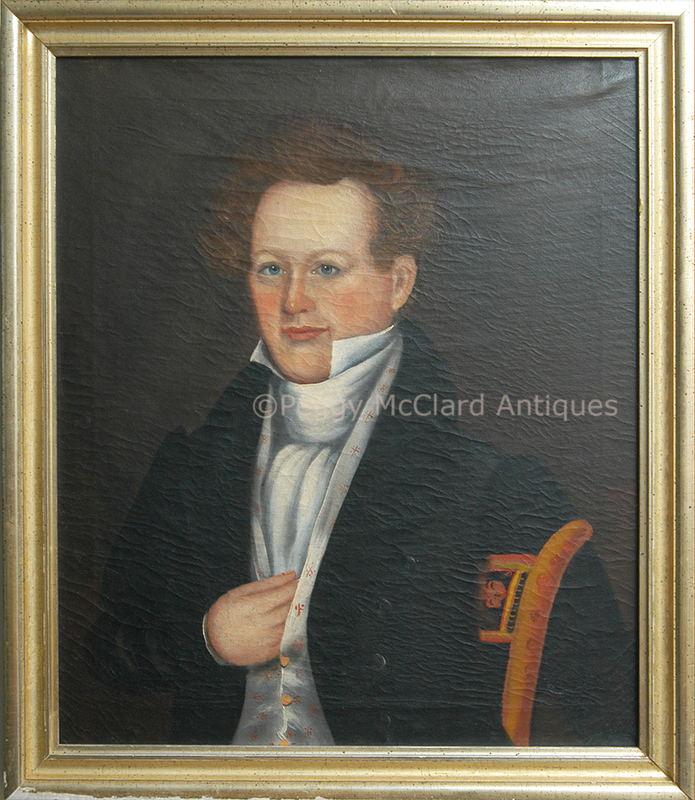 Speaking of framing the face, the man’s shirt collar is very tall and very stiff so that it stands more than half-way up his chin….very popular in the 1820s. He wears a white stock which covers the front of his shirt. And, oh, the chair! What a gloriously vibrant red and black painted American Fancy period chair. A wood side chair with a background of red which the artist highlighted with yellow paint. It is decorated down the side rail with red dots. The top rail peeks out from under his arm and shows its decoration of red, yellow, black and possibly green with vertical stripes, horizontal crosshatches and what is either a central decoration of fruit or flora. The colors stand out and really draw the eye as does the light colored embellished waistcoat and the vibrant skin tones. 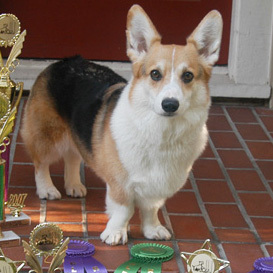 This portrait is a real winner in my book! 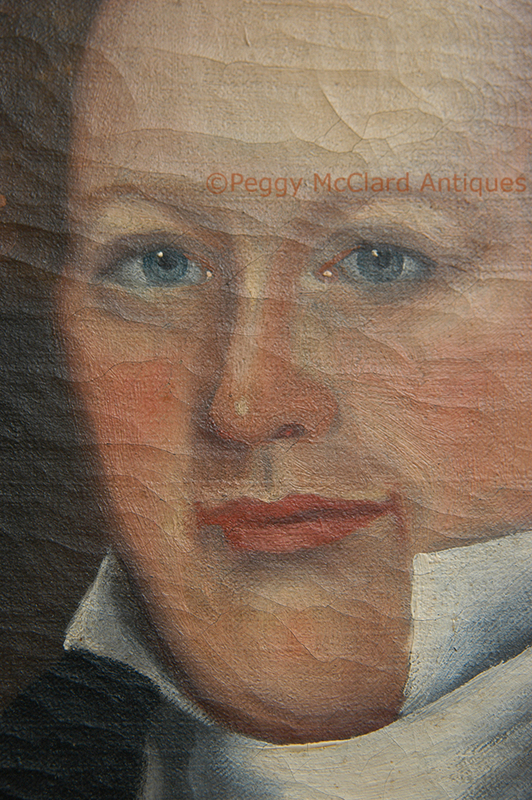 The painting has been lightly cleaned and has no other restorations or repairs that I can find. 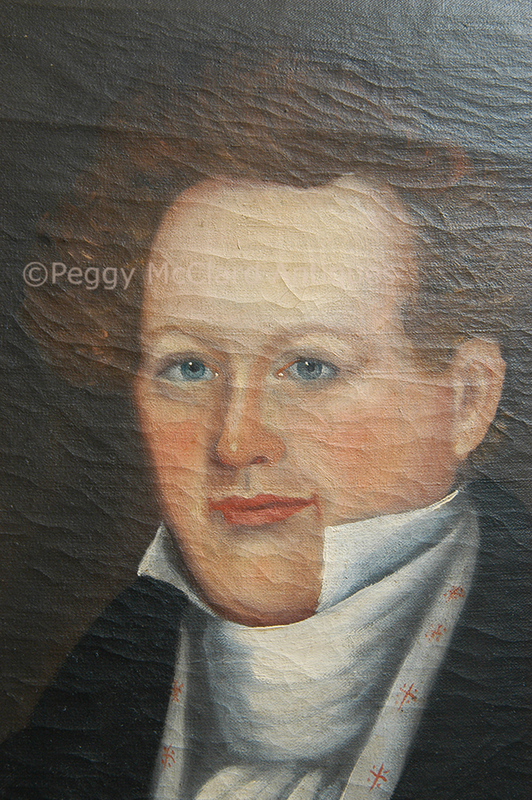 Never lined, you can see the blue & white stripes of the mattress ticking when you look at the back of the portrait. It is framed in a period gilt frame that measures 26” x 30”. Circa 1825.